Aug. 23, 2012 • Glaciers are one of the largest reservoirs of freshwater on our planet, and their melting or growing is one of the best indicators of climate change. 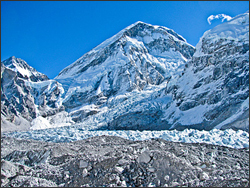 However, knowledge of glacier change has been hampered by lack of data, especially for understanding regional behavior. In a study published in Nature today, scientists assembled new datasets from Earth-observing satellites and found that glaciers in the Hindu Kush–Karakoram–Himalaya region (HKKH) lost 12 gigatons per year over the period 2003–08, much faster than previously reported. The HKKH is a 2000 km-long group of mountain ranges in Asia containing about 60,000 sq km of glaciers, glacierets and perennial surface ice in varying climatic conditions. These ice masses exhibit a complex response to climate and this makes the analysis of changes in the region difficult.